One of the things I wasn't expecting to see today was a turtle attempt to mate with a Croc sandal. Oh, this is Kotaku Off Topic, if you didn't read the headline. That's actually the second video of a turtle gettin' it on that I've seen on the internet. Their little squeaks are kind of endearing, even if YouTube videos of turtles knockin' boots has a tinge of creepiness to it. But of all the things I've seen on the internet, I'll take turtles getting their freak on over a lot of other things. 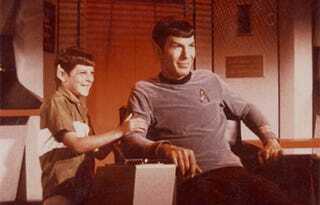 Why is that Spock and son picture in this post? Because it's Tangential Tuesday. Duh. Anyway, if you don't want to talk about turtles doing the nasty—the silver lining of this is that I want to watch my TV Funhouse DVD collection—carry on to the comments and talk about whatever. From Sawyer to super hero? - Josh Holloway may be assembling for an Avengers role. In-N-Out Burger Heads To Dallas, Texas - The more burgers the better. Google Doesn't Want To Do Windows Anymore - Moving to Mac, Linux and Chrome OS for security reasons. Al and Tipper Gore announce separation - To think they'll never awkwardly mash their faces together is sad.